We’ve been waiting for the release of Secret Of The Stones for some time now and are pleased to be able to publish a full review of this new online slot review from Net Entertainment. It’s a lovely-looking game based on the mystical world of the druids – those priests we associate with pre-Roman times in some northern European countries. So this is a five reel and twenty five payline slot with a slightly laid back, haunting soundtrack; the reels are set inside a stone arch of the type you might see in a standing circle although this one is adorned with Celtic carvings. The basic playing card symbols are similarly decorated while the main icons are animal representations – snake, wolf, bull, owl and deer. Bonus symbols are a tree scatter and a druid wild which can expand in the bonus round to fill the entire reel. 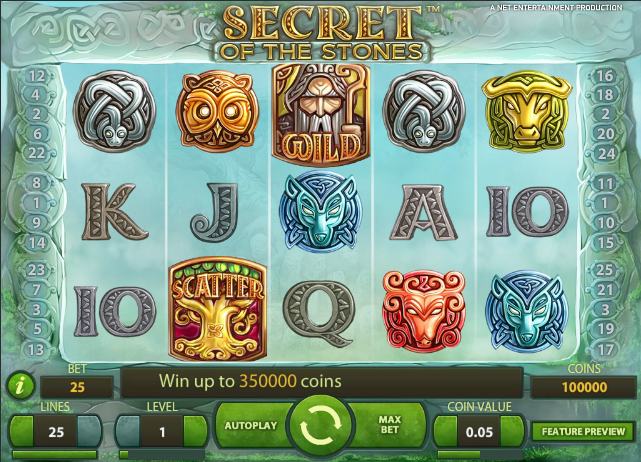 Secret of the Stones features a fairly standard free spins round but because this is a Net Entertainment slot there’s something a little extra. You need to land three, four or five of the tree scatter symbols anywhere on the reels and you will then receive the corresponding number of picks on the next screen. As you can see from the video below you will now get to pick from a screenful of carved standing stones and you will be awarded extra spins, extra or expanding wilds and multipliers. Now you just need to start the round and you can add the extra spins to the ten you will receive initially. Particularly helpful are the expanding wilds on reels two and four. If you’re just going for the free spins then you can play with minimal lines as the feature is triggered by scatter symbols. Of course any payouts in that round will be based on your total line bet so it works both ways. Secret of the Stones may not have the creativity of some other Net Ent slots but it still compares well to most other games. It looks and sounds great and should keep you entertained for some time.